Recipe for Success: The Work of Rose Cabat | Toomey & Co.
Rose Cabat (June 27, 1914 – January 25, 2015) made her reputation somewhat accidentally, in the late-middle age of her life, by devoting herself to work that she loved. After a decade of failed attempts with earthenware and stoneware forms such as conventional vases, casserole dishes, and wind chimes that she sold at craft fairs, success found Cabat in the form of her famously named porcelain Feelie vases. Rose Cabat was open about her construction techniques, but very secretive about the glazes that made the Feelies so distinctive, never revealing her formulas. 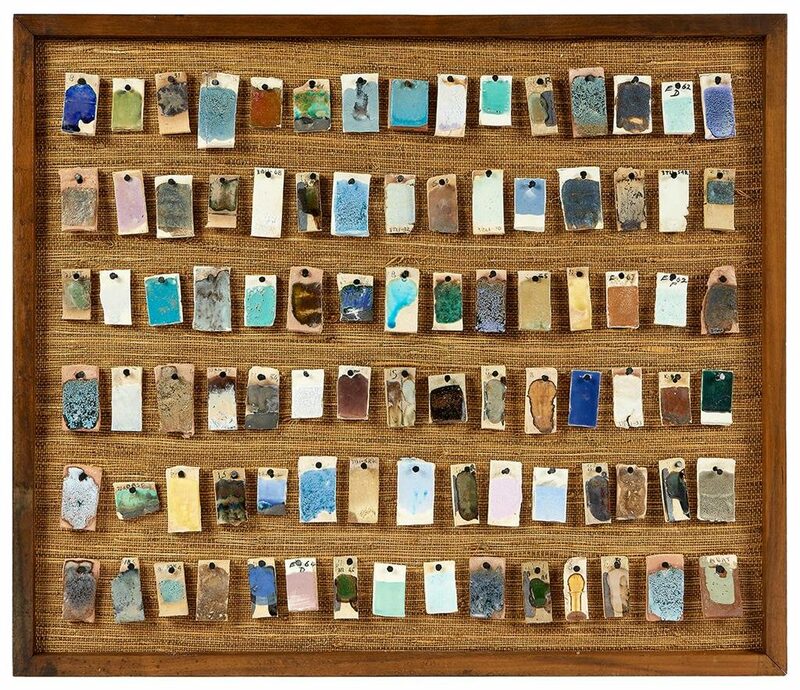 The 90 glaze samples in Lot 653 of Toomey & Co. Auctioneers’ Art & Design auction on September 16, 2018 are remarkable not only for their beauty, but because many feature Rose’s elusive glaze recipes on their backs. Obtained by the current owner at an estate sale on Rose Cabat’s property, the samples were found scattered throughout her studio, in buckets, and half-buried in the dirt outside of her potter’s shed. Rose and Erni Cabat met as schoolchildren in New York City in the 1920s, marrying in 1936. 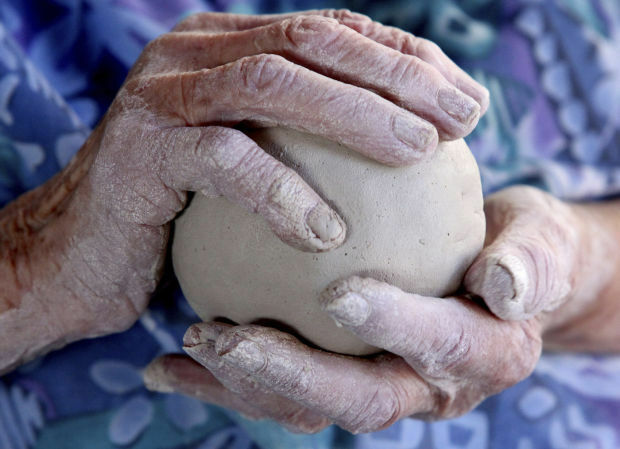 Erni, while working as an apprentice for Austrian potter and sculptor Vally Wieselthier — who herself had studied under Koloman Moser and Josef Hoffmann — brought a lump of clay home to the apartment that he shared with Rose. This simple act sparked a passion that continued unabated for the rest of her life. 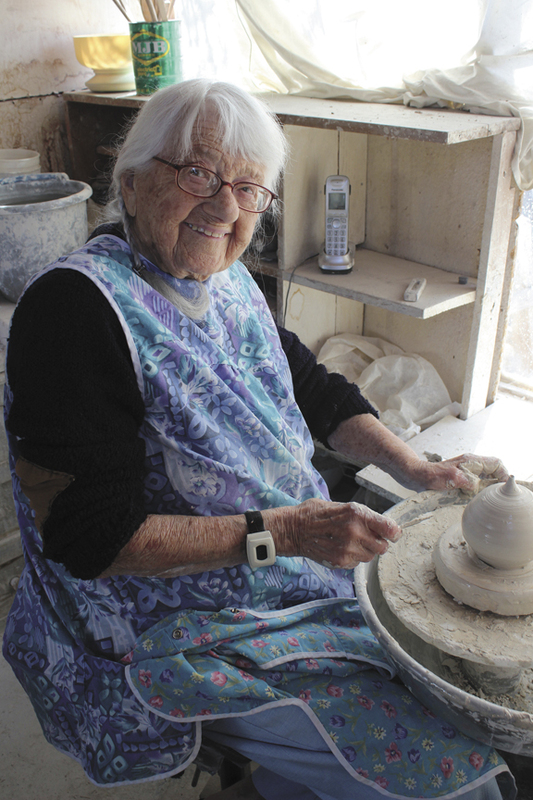 After making a simple coiled vase from the clay, Rose learned wheel throwing at Greenwich House Pottery* in New York’s West Village, teaching herself to work on a kick wheel. 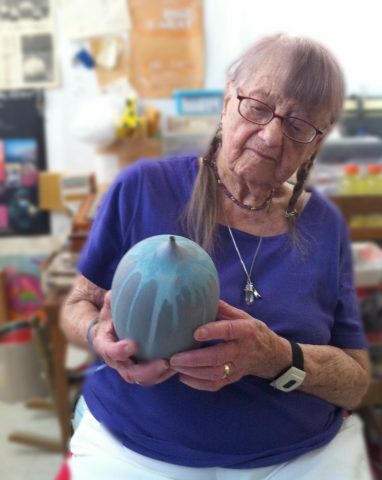 When their son’s asthma prompted the family to move from New York to Tucscon, Arizona, Erni built Rose an unassuming studio on the dusty streets outside town that Rose referred to as a “shack.” He obtained a potter’s wheel made from a converted washing machine and she used a tractor seat for a stool. Life intervened in the form of a growing family, World War II, and a job as a riveter on an Air Force base, but Rose persisted. 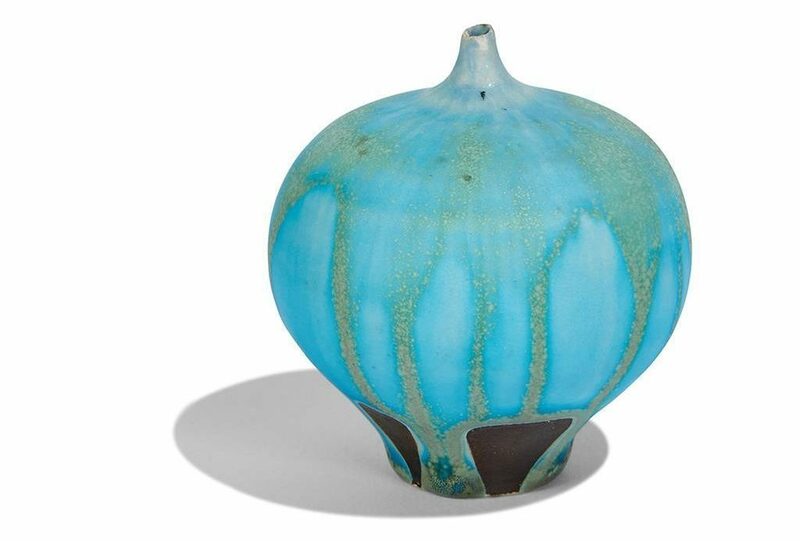 In 1957, she attended a five-week glaze course offered by the art department at the University of Hawaii. In this course, she was exposed to modern studio ceramics, which led her to work exclusively in porcelain. 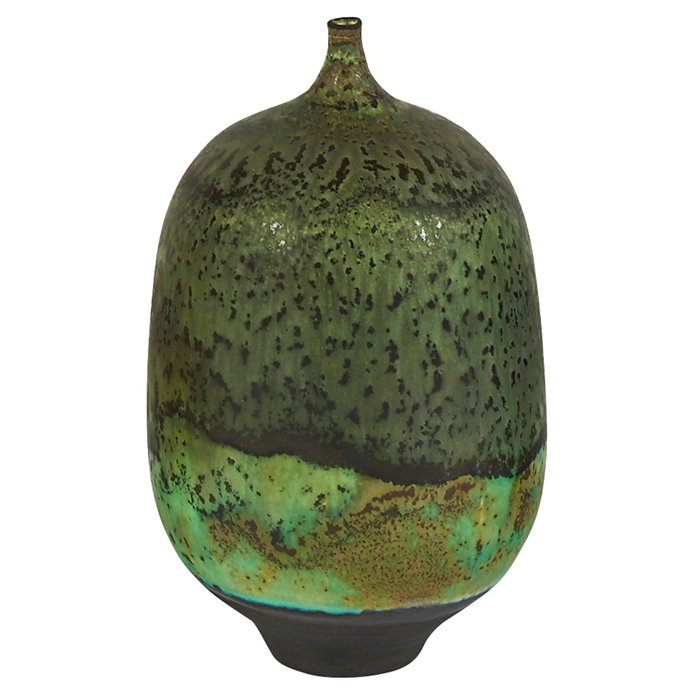 With husband Erni, she experimented with glazes; together they created the signature satin matte glaze notable for its silky quality. Rose named the pots around 1960, when she held a finished example in her hands and remarked, “Now this one’s a feelie!” The Feelies — unlike most other vases — emphasize the tactile experience above all else. Unable to hold even the smallest reed, they offer beauty for beauty’s sake, without functionality. The shapes resemble things found in Rose’s garden: onions, figs, cucumbers, and tomatoes. 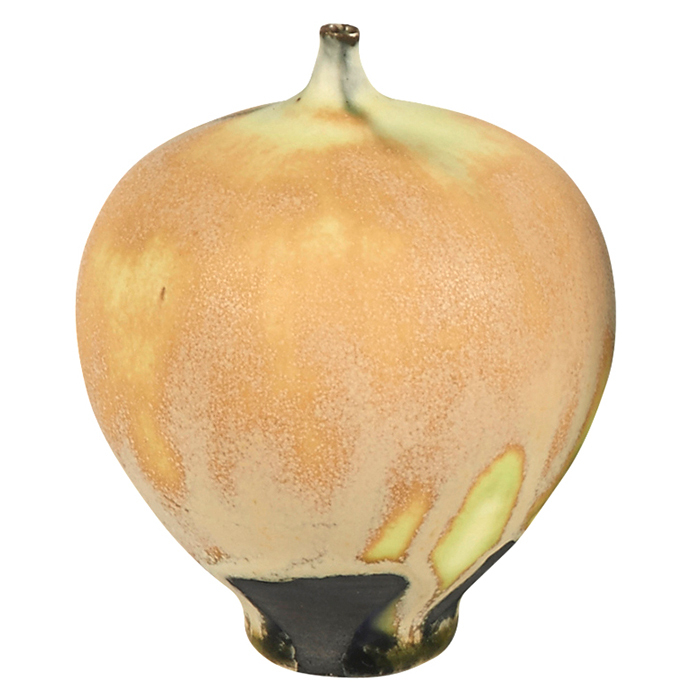 Many have glazes also named for fruits, vegetables, or flowers: onionskin, cucumber, olive, lavender, etc. 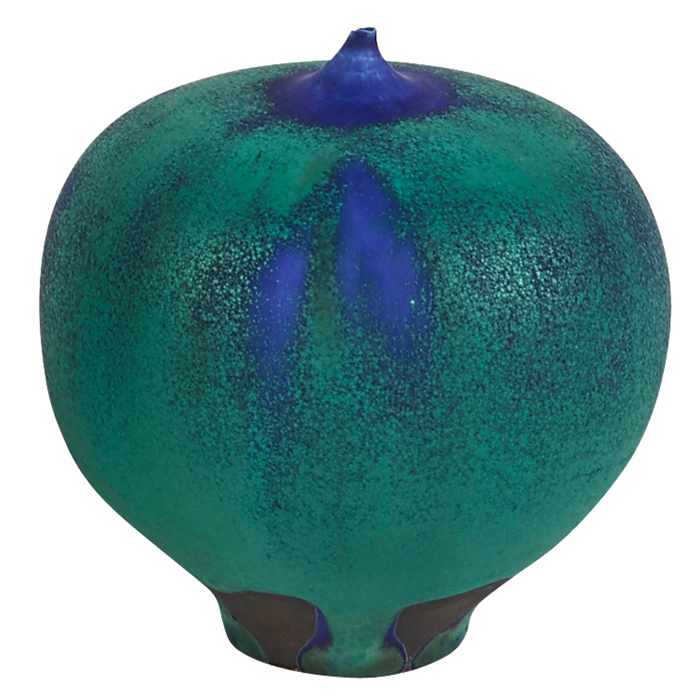 Toomey & Co.’s Art & Design auction on September 16, 2018 will feature two lots by Rose Cabat. To view the detail pages for these items, click on the individual images below. Lieberman, Paul. “A Life’s Refined Shape.” Los Angeles Times, 18 July 2004, articles.latimes.com/2004/Jul/18/Entertainment/Ca-lieberman18. Web. 7 Sep. 2018. “Rose Cabat Biography.” ASU Art Museum, Apr. 2009, asuartmuseum.asu.edu/sites/default/files/cabat_rose_biography.pdf. Web. 7 Sep. 2018. Whitney, Kay. “Rose Cabat, ‘That Would Look Lovely in a Cobalt. '” Ceramics Monthly, 6 Feb. 2018, ceramicartsnetwork.org/ceramics-monthly/article/rose-cabat-look-lovely-cobalt/. Web. 7 Sep. 2018. Wikipedia contributors. “Rose Cabat.” Wikipedia: The Free Encyclopedia, 23 Jul. 2018, en.wikipedia.org/wiki/Rose_Cabat. Web. 7 Sep. 2018.